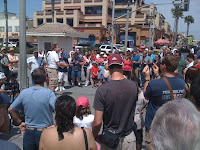 This Saturday we went down to the Huntington Beach Pier to pass out gospel tracts and witness to the lost. There were 60+ fellow evangelists there who were participating in the Ambassador's Academy. The air was electric as many from the academy were preaching the gospel in the open air. Those who weren't preaching were either passing out gospel tracts, witnessing 1to1 or encouraging those who were preaching. It was impossible to make it from the street to the pier without getting a gospel tract offered to you!! I spoke with several of the academy participants and they all agreed that the academy was the experience of a lifetime -- and that was after the previous days challenges on Hollywood Blvd. battling the intense heat, hecklers, angry pornographers, security, and police! If you want to turbo-charge your zeal for the lost, I highly recommend attending an upcoming academy (the next one will be in April '10). This Saturday (08/29) we will be at the Huntington Beach Pier from 12pm-2pm. The Ambassador's Academy participants will be there as well so there will be 60+ evangelists out sharing their faith! If you would like to join us then let me know by email - Jeff@LoveTheLost.org - or just show up at the pier at noon on Saturday. This Sunday at the train station was another great afternoon of preaching the gospel to every creature within earshot. There was a definite change of climate at the train station however. It seems that there is another lady working the train ticket booth and, unlike the previous attendant, she is not at all friendly to the proclamation of the gospel! When we arrived at the train station at 12pm, I setup my flip chart with the "You broke the law, but Jesus paid you fine" poster and the ten commandments. We then prayed and I stepped up onto the box and preached a quick gospel message to the lineup of people waiting for the train to clear the tracks. A man who was playing his guitar stopped to listen. My wife later told me that the ticket booth attendant approached the man and sternly told him that he did not have to stop playing his guitar just because somebody was preaching. He then proceeded to gently and considerately tell the lady that he would not play while God's word was being preached and that he would not even be alive if it were not for God's hand on him! This really baffled the lady and she went back to her booth. My wife spent the next 45 minutes ministering to and being ministered to by this man. What a blessing! It turns out that the angry ticket booth attendant also scolded Dave for passing out tracts. Please pray for this lady, and pray for our continued favor as we witness at the train station. Many people heard the gospel on Sunday, the word of God was read aloud, and we were able to get the message into many hands in the form of gospel tracts. Please pray that those who heard would repent and put their faith in Jesus alone for salvation. Have you ever lied (even once--fibs, white lies, etc.)? Ever stolen (anything--the value is irrelevant)? Jesus said, "Whoever looks upon a woman to lust after her, has committed adultery already with her in his heart." Have you ever looked with lust? If you have said "Yes" to these three questions, by your own admission, you are a lying, thieving, adulterer at heart; and we've only looked at three of the Ten Commandments. That's how God sees you. Nothing is hid from His holy eyes. Will you be innocent or guilty on the Day of Judgment? Listen to your conscience. You know that you will be guilty, and therefore end up in Hell. That's not God's will. He provided a way for you to be forgiven. He sent His Son to take your punishment: "God commended His love toward us, in that, while we were yet sinners, Christ died for us." He was bruised for our iniquities. Jesus then rose from the dead and defeated death. He is your "ticket" to Heaven. He is the "way," He is the "Door," the only "mediator." There is salvation in no other name, so pray something like this: "Dear God, I repent of all of my sins (confess them). This day I put my trust in Jesus Christ as my Lord and Savior. Please forgive me and grant me your gift of everlasting life. In Jesus' name I pray. Amen." Then read the Bible daily and obey what you read (see John 14:21). God will never let you down. Just a quick reminder that we will be down at the San Juan Capistrano train station every Sunday after SCCA's AM service from 12pm-1pm to sing,read scripture, preach the gospel, pass out tracts, and one-to-one witness. Come join us this Sunday and see what the Lord is doing at the train station. Email me at Jeff@LoveTheLost.org if you have any questions or want more info. Then He said to His disciples, "The harvest truly is plentiful, but the laborers are few. Therefore pray the Lord of the harvest to send out laborers into His harvest." My First Custom Tract - I have created my first custom tract. Thanks to Marv at One Million Tracts for all the help! Please click HERE to have a look!